‘Magnificent Malevolence’ continues the fictional dialogue C.S. Lewis begin in 1942 (The Screwtape Letters), adding a new voice to the popular story. Wormwood and his devilish colleagues are back – as diabolically clever as ever. Crumblewit (Order of the Sons of Darkness, 1st Class) documents the struggles between good and evil on earth from 1942 (when the Screwtape Letter’s first began) to the present day. Crumblewit’s particular job was to muddle in the lives of the ‘saved’, overthrowing the attempts of Christians to carry out the mission given to them by the ‘Unmentionable One’. A fantastic read full of humourous rants and compelling anecdotes, this book attempts to bring C.S. Lewis’ clever book which exposed the short-comings of Christians into the present day – and it succeeds. Popular historian Derek Wilson came to prominence 40 years ago with 'A Tudor Tapestry'. He is the highly acclaimed author of over 50 books and has written and presented numerous television and radio programmes. He lives and writes in Devon. 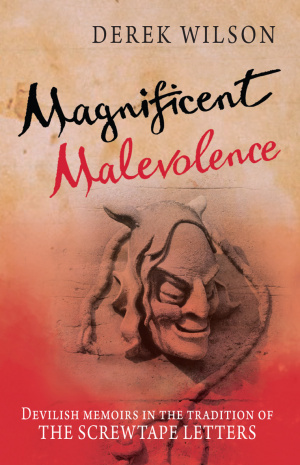 Magnificent Malevolence by Derek Wilson was published by Lion Hudson in March 2013 and is our 33253rd best seller. 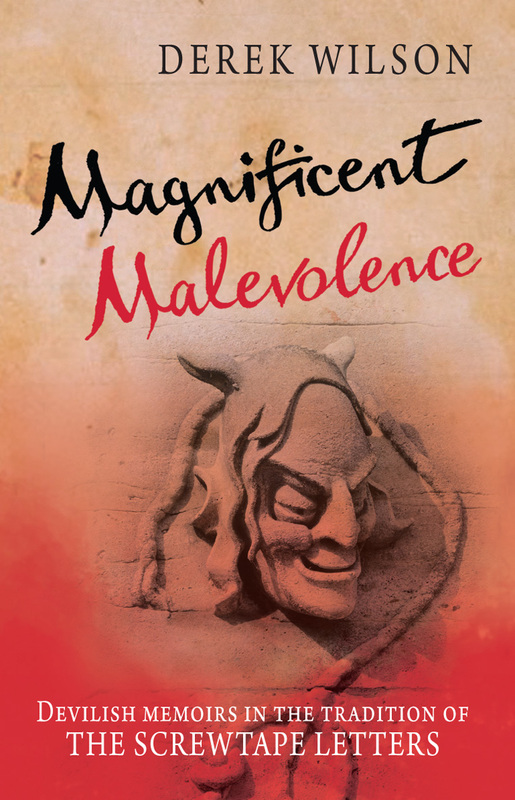 The ISBN for Magnificent Malevolence is 9781782640189. If you like the Screwtape Letters you are very likely to enjoy this book. In some ways it is an updating of the Screwtape Letters, that is to say that the original material, tone and intent remain in this book and therefore do make it fun to read. The book picks up in effect at the time when Screwtape left off to a degree - indeed if anything this book is a lovely little "church history" book told from the other side, a guide through the intervening years up to the modern day of the changing movements within the Christian faith in those years - their successes and their failures! It's an intriguing and enjoyable take on the modern church that, just as the original did, is likely to sting a little bit at times. Overall an enjoyable read and a nice gentle homage to C S Lewis. Got a question? No problem! Just click here to ask us about Magnificent Malevolence. 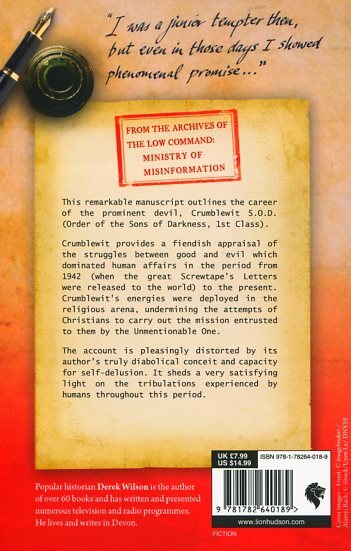 This remarkable manuscript outlines the career of the prominent devil, Crumblewit (Order of the Sons of Darkness, 1st Class). It was in a much mutilated state. Nevertheless it presents a reasonably coherent narrative of the activities of a post-Screwtape generation of devils. It is not, of course, "true" in the sense of being an objective appraisal of the struggles between good and evil which dominated human affairs in the period from 1942 (when Screwtape's Letters were released to the world) to the present. The account is distorted by Crumblewit's truly diabolical conceit and capacity for self-delusion. However, it does shed fresh light on the ups and down experienced by the Church throughout this period. Crumblewit's energies were deployed in the religious arena.